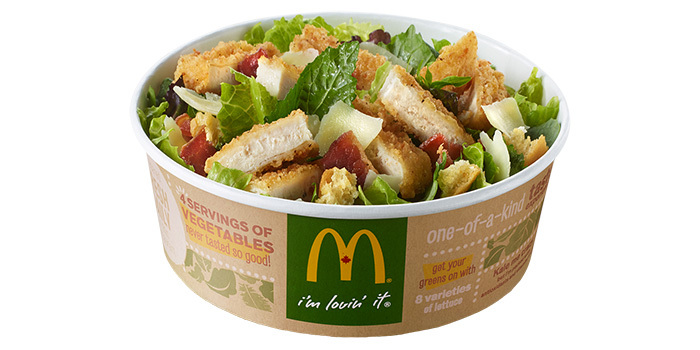 McDonald’s recently stepped up their salad game, adding a kale salad to its Canadian menu. When we first got wind of the “Keep Calm, Caesar On” salad, we were curious – after all, it was only a year ago that McD’s was mocking kale in a Big Mac commercial. The official nutritional numbers for the kale salad took us by surprise. Turns out, you might actually be better off sticking with a burger — even the four-patty Double Big Mac. The kale-based Caesar salad with crispy chicken, clocks in at 520 calories, 31 grams of fat, and 1,140 milligrams of sodium. And that’s before you add the asiago dressing, which adds another 210 calories and 22 grams of fat. The grand total is 730 calories, 53 grams of fat, and 1,400 milligrams of sodium (about the same as Burger King’s Bacon Chicken Ranch Salad or Wendy’s Spicy Chicken Caesar Salad). It is also available with grilled chicken, though the website does not include the nutritional information for that option. By comparison, the Double Big Mac — which includes four beef patties — has 680 calories, 38 grams of fat, and 1,340 milligrams of sodium. The salad is also loaded with vague-sounding ingredients like “flavor,” “color,” and “microbial enzyme.” (Yum?) And the crispy chicken alone contains more than 15 ingredients. “When you’re looking at a food product, look at the ingredients,” says Denis Faye, MS, Senior Director of Nutrition Content for Beachbody. Ideally, a salad should be made from whole ingredients — such as veggies, beans, seeds, oil, and vinegar. So if you’re jonesing for a burger, you might as well order a burger, because the Caesar salad won’t satisfy your cravings or save you any calories. If you’re trying to take baby steps towards healthier eating habits, a better bet would be to order a cheeseburger with a side garden salad instead of fries, opt for balsamic vinaigrette, and only use half the dressing. That will give you a fast food splurge with a side of actual veggies, and your total caloric intake will only be 390 calories. And best of all, your diet won’t have been derailed by a cheat meal in disguise.